The French don’t eat a lot of cereal and neither do I. But unfortunately (or fortunately) I married a cereal eater and he has managed to turn our two children into cereal eaters too. Gone are the good old days of toast. In the US there are so many types of cereal, it’s an ongoing joke (at least in my mind) that in France they have a double aisle for yogurt and in the US we have a double aisle for cereal. 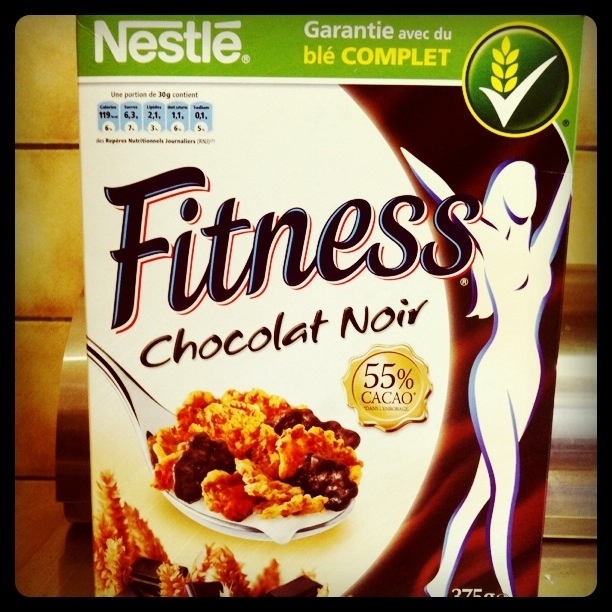 It’s particularly funny to try to buy cereal in France because the French don’t really get cereal (and neither do it). They get yogurt and cheese and bread, but cereal? Non. The way that they’ve decided to tackle the great cereal debate is just to take a standard Wheaties-type cereal and put real chocolate in it. You can also chose between milk chocolate, white chocolate or dark chocolate. Nice. I told Tim that I thought the only reason they even had cereal on the shelves in France was to satisfy the Americans. At that point he tried to make some sort of argument that the French cereal is not for Americans, it’s for the very discerning French. Otherwise why would they put REAL chocolate in it? His theory was, if it was for Americans, it would just be fake chocolate like all of the American cereal. I love you, Tim – cereal or no cereal. This entry was posted in food/drink and tagged cereal, France, toast. Bookmark the permalink.